The State of Hawaii became the 50th state of the United States of America on August 21, 1959. The island state is situated in the North Pacific Ocean, 2,300 miles (3,700 km) from the mainland, at 21°18_41_N, 157°47_47_W. In the 19th century, Hawaii was also known as the Sandwich Islands. The Hawaiian Archipelago comprises eight islands and atolls extending across a distance of 1,500 miles (2,400 km). Of these, eight high islands are considered the “main islands” and are located at the southeastern end of the archipelago. These islands are, in order from the northwest to southeast, Ni_ihau, Kaua_i, O_ahu, Moloka_i, L_na_i, Kaho_olawe, Maui, and Hawaii. 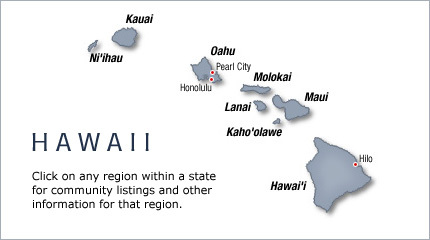 The latter is by far the largest, and is very often called the “Big Island” or “Big Isle” to avoid confusion with the state name.